Mivv choose us like official web reseller. This is a guarantee for. 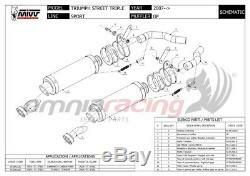 Mivv gp approved black steel exhaust pipes for triumph street triple 2007> 2012. The kit includes the link-pipe (if necessary), and all the mounting parts. Exhausts are developed with the original ecu, so the assembly does not require remapping of the same or additional ecu assembly. Complete your order with a bmc air filter clicking here. Complete your order with an air filter sprint filter clicking here. Complete your order with a bazzaz control unit clicking here. Mivv gp - short, versatile and despicable. 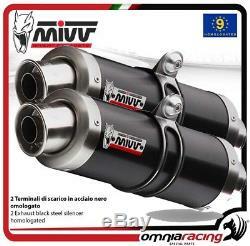 Mivv is a compact exhaust system with a racing soul. The round shape of the silencer and the removable db-killer combined with the characteristic enlarged spouts characterize this exhausting enriching the racing style. Technical solutions deriving from the world of competitions guarantee excellent yield, versatility and usability of the engine. There are three versions available for this slip-on. Lightweight, made with titanium central body, reduces the weight by about 45% compared to the stainless steel version, which is why it is designed for those who want to have a more exclusive exhaust. Lightweight, made with a central body in carbon fiber, designed for those who want to have a slip-on that expresses technology. Composed of a central body in black stainless steel with a black satin brushed effect, obtained with a special coloring process. The "short round" is this approved product, which is derived from a long and in-depth research carried out within the R & D department. Design made in italy directly from motogp. Employment of the best materials, which are available in the market. High technology coming directly from motogp experience, which only few factories can offer. 3k carbon black impregnated with special resins. High reliable materials, which are the result of a long research & development activity. The system guarantees high power and torque performances. It's ideal for race. Shrill sound for an extreme product use. Homologated silencer in compliance with the guidelines. Huge weight loose unlike and better bike versatility. Popular brand in the motogp; absolute guarantee of steady innovation. Reliable after-sales-service, that solves all your problems. In 1994, the passion and experience of manufacturing bertollini created omnia racing, with the aim of representing a reference point for everyone fond of bikes. In 2000, when salvatore orefice joins omnia racing, the company is founded, a society based on the passion and competence needed to create and trade the top products for motorbikes. Our continuous search for perfection and performance, using advanced technologies, has allowed us to interact with internationally recognized pilots and teams. Accostato, afam, aim, akrapovic, andreani, arrow, bazzaz, bc battery controller, bitubo, bmc, braking, brembo, bst, capit, castrol, derry moto, tuning fork, did, discacciati, eibach, ek, fabbri, far, frentubo , galfer, gbracing, giannelli, gifrap, givi, gopro hero, gpt, h2o, hagon, ixil, jollymoto, kappa, laser, lcr saddle, leovince, lightech, mafra, marchesini, marvic, marzocchi, matris, mivv, mra, nissin , ohlins, pbr, polini, pt, rizoma, rme, robby moto, sachs, stm, stomp, superb, suter, termignoni, valtermoto. Omnia racing is one of several important events: padova expo bike, national and international races, free circuit sessions. On the web, we are always associated with a direct contact with the customers, so we suggest the product that best suits their needs. This should allow our customers to feel at ease. All this has not been a decade ago, a reference point in italy; in addition, our products are still in demand in Europe and in the United States. The item "mivv gp 2 muffler approves black triumph street triple 2009 09" is on sale since Tuesday, May 15, 2018. It is in the category "auto, motorcycle parts, accessories \ motorcycle \ spare parts \ systems" exhaust \ silencer, deflectors ". The seller is "omnia-racing" and is located at 80055. This item can be delivered anywhere in the world.